I was invited to join the Rotary Club of Colville in 2005. I didn’t get Rotary at first. I wandered and wondered what I was supposed to be doing in this thing that seemed so complex. Eventually I began to understand how cool Rotary really is; how comprehensive in doing good at any opportunity, and even going to look for it. Once I understood, I became pretty active. I have served as my club’s Club Service Chair, Community Service Chair, Secretary and President. Part of the complexity is understanding other levels of Rotary outside my own club, and I discovered the District. I served as Assistant Governor 2015-18, and had tons of fun doing it. I was a rare International Assistant Governor serving 4 clubs in Canada and 2 in the U.S. I really enjoyed making friends all over; I was even made an honorary Canadian by one club (I hope they were serious anyway!). I served as a Pacific Northwest Pets Training Leader for two years, and as District Secretary before deciding to apply for the District Governor position. I have completed the Rotary Leadership Institute and I am a Paul Harris Society Member and a Benefactor because I strongly believe in the power of The Rotary Foundation. I have a Bachelor of Fine Arts degree from Illinois Wesleyan, but it took me 20 years or so to use my degree in a productive fashion. I worked as a ranger aid for the California Department of Parks & Rec, and then as a ranger for the National Park Service before starting a sign company, which I’ve been operating for the last 20 years in Colville, Washington. I love the inland Pacific Northwest, and spend as much time as I can enjoying it. I love road cycling and mountain biking and playing in the mountains, but my favorite time is meandering around our property with our dogs. 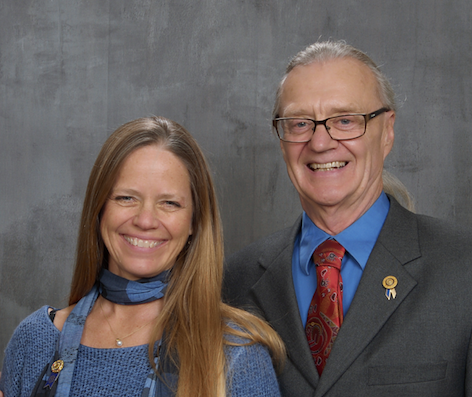 I am married to Ed Kowitz, who joined the Rotary Club of Kettle Falls after retiring from a career as a veterinarian for 40 years. He is currently serving as President (for the second time), and is getting active in District work. He is a Paul Harris Fellow and Benefactor.